Roses in a Round White Box. 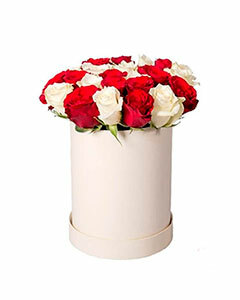 A beautiful Arrangement of 24 White and Red Roses in a round white elegant gift box. Perfect for Birthdays, anniversaries, Valentine's, Mother's day, new born baby girl celebration, graduation, get well and many more. Mixed Bouquet Spring mix Bouquet "Enchant"